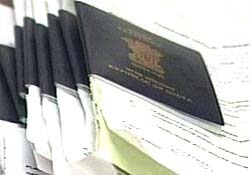 I remember the time when I applied my passport back in 1999. There was a long application process, waiting process, and the verification process. This would take anywhere between 20 days to 1 month. Did I mention there was a lot of red tape involved in that? I really did not see what the fuss was all about for printing a 20 odd page book with a blue cover. That was like 9 years ago and my passport is ready for renewal. Now, that is all going to change forever. Government is introducing e-Passport facility (also known as biometric passports) in which would be safer against any malpractice (counterfeit passports) and also facilitates smoother movement across borders (of course which are equipped with e-passport reading facilities). The process has already started and few prominent people already have it. President and Vice-president and the prime minister are among the few people who already have it. I guess Dr. Manmohan Singh will be using this for his coming trip to USA to meet with President Bush to complete the nuclear deal. Ministers and other diplomats (beaurocrats) will soon get it. The growing economy and foreign interest in the country has led to a surge in the number of passports issued from 22 lakh in 2000 to 50 lakh in 2007. This is expected to grow to 58 lakh in 2008 and over 80 lakh by 2010. All this will be possible if only the non-value added tasks (for the government) are outsourced. Government is planning to outsource few tasks (which usually take a longer time) to 3rd party vendors selected through a bidding process. Tasks like initial scrutiny of applications, fee acceptance, document scanning and taking photos will all be outsourced. Now, that is what we call cutting the red tape. Passport Demand drops first time in 5 years – People traveling lesser ? This is a great initiative…Biometrics is the way forward. Wishing luck to get this in soon…Cheers!!! From which date this service getting start and on which site. If this is truly a reality, and 3 day passports become a reality, I think it would be a huge service to the American people. I hope this is true because it could potentially change the way people travel.